We are honored to announce that ReWA’s Youth Program has been selected as a winner of the Seattle CityClub’s Colleen Willoughby Youth Civic Education Award! Along with four other leading youth civic education programs, ReWA’s Youth Program was chosen from a pool of over 80 applicants. Judges selected winners based on the knowledge, skills, values, and experience that students gain from participation. “Winning programs connect youth to leaders and experts to foster healthy conversation and strong understanding of the community they live in, provide hands-on experience in civic engagement, and foster life-long civic values in young people. Each program supports youth who are engaged in their communities, building vibrant civic health in their schools and families, and strengthening our democracy,” says a press release from the Seattle CityClub last week. ReWA’s Youth Program aligns with these goals. Among its many accomplishments this year, the Youth Program published “One Family, One Heart, One World,” a compilation of poetry, short stories, letters, and interviews that chronicle students’ perspective on persecution, the diaspora, and adapting to life in the United States. 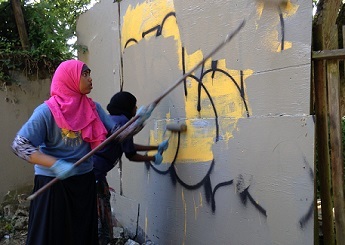 Students also completed service projects to help fight hunger, remove graffiti, and clean-up local parks. Last fall, ReWA youth challenged the Seattle School Board in a decision that would have robbed the Seattle World School of their $170 million promised building and facilities allocation. Through their advocacy and engagement, both the building and funds were secured. Recognition of the civic excellence of ReWA’s Youth Program will allow best practices to be shared with other youth programs state and nation-wide. ReWA is most excited to share lessons of cultural competency, lesson planning, and integrating youth voice into the selection of service learning projects. Congratulations to our students and staff on this amazing honor!